The ‘shallop’ that transported the settlers from the Mayflower to shore. 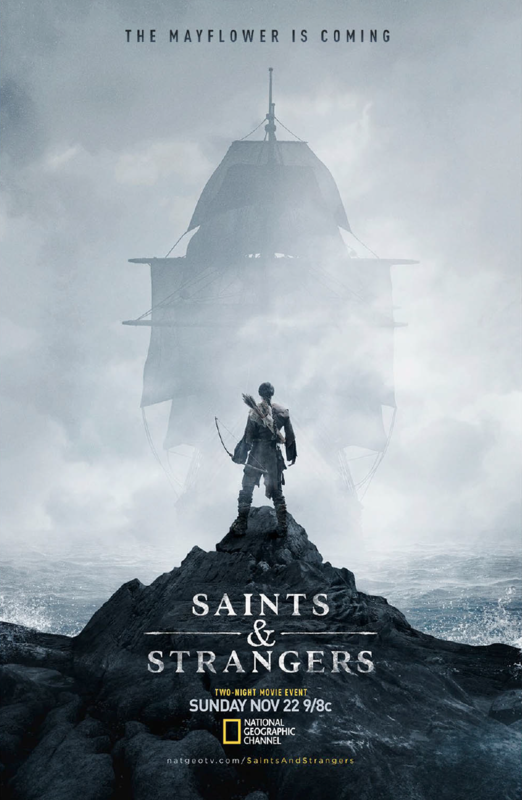 “Saints & Strangers” is a new scripted mini-series event coming this November to the National Geographic Channel. It tells the story of the Pilgrims who landed in New Plymouth in 1620 after a long trip across the Atlantic on the Mayflower. I’m guessing that everyone knows the basics of the story – the Pilgrims were religious exiles who sought a new land to call home, and made peace with the Natives (you know, on Thanksgiving) and survived a harsh trip in a time where life was hard and death was easy. But this story doesn’t dwell in the traditional tropes of the Thanksgiving story – you won’t find any shiny-belt-buckled shoes and tall Pilgrim hats here – it’s a bit more of a dirt-under-the-fingernails story that shows just how harsh life was for this group of English settlers. Sunset shot of the Pilgrim village on day 2 of production. These courageous explorers started a new civilization from scratch in the middle of the woods, surrounded by Native Americans that may or may not attack your colony at any time. One angle that always appealed to me was that despite the obvious differences between the Settlers and the Natives, their experience wasn’t all that different. They were both faced with a unpredictable, volatile situation, facing another group that they didn’t fully understand. So while it appears like they can’t possibly relate to one another, in fact it was quite the opposite. 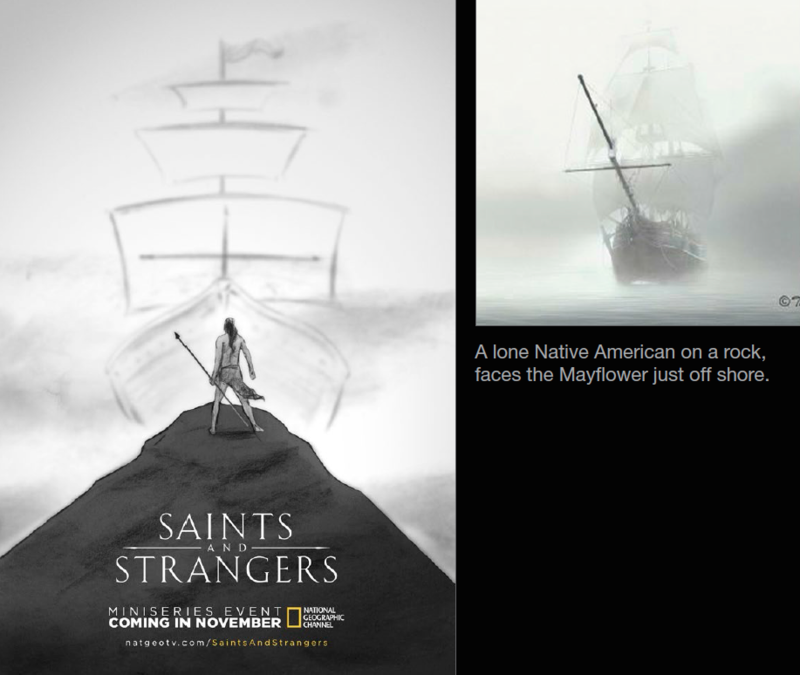 The other twist – and the significance of the title itself – is the dynamics between the Pilgrim group (the ‘Saints’) and the men and women that came across the Ocean with them seeking fortune and a fresh start (the ‘Strangers’). The question was how we could tell this complex story that people might think they already knew – and do it in a style that felt new and different from their expectations. 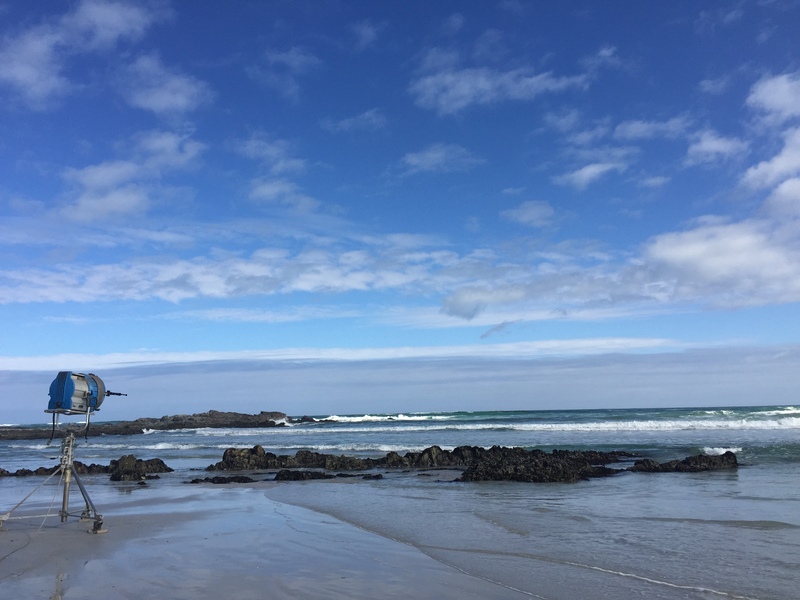 View of the Indian Ocean and Seal Island off the coast of Cape Town. So the show was green-lighted at the beginning of the Summer and from the beginning there was one massive challenge we faced – the show would be filming in July and August, posting in September and October, and airing in November. That’s an extremely tight schedule for a scripted film – and early on I knew that for a film this big and important, we were going to need assets early to make a killer campaign. 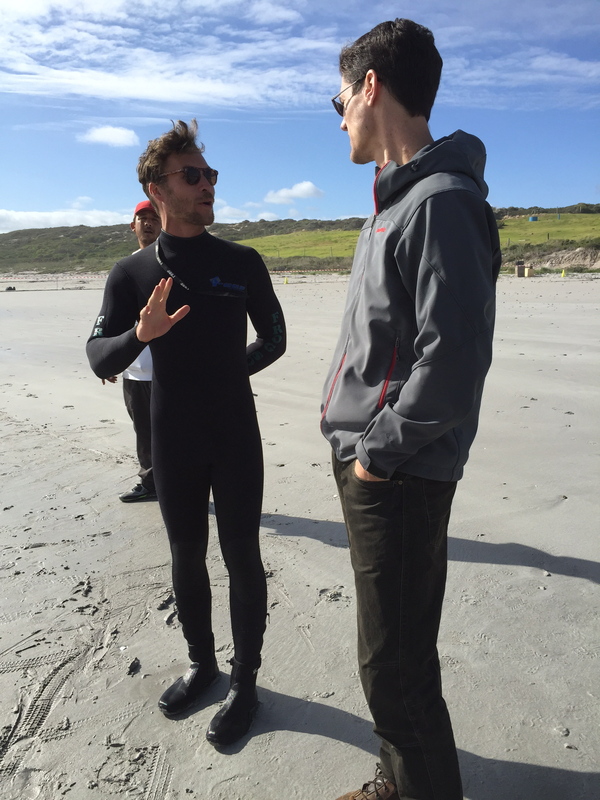 And the first big hiccup for us presented itself – they were going to be shooting the film in South Africa. Whenever I tell someone that we were shooting the Pilgrim story in South Africa, there was a lot of “huh?” reactions but it does make a lot of sense. Finding untouched beaches are a challenge, particularly on the East Coast, as well as a shoreline and topography that matched Massachusetts. 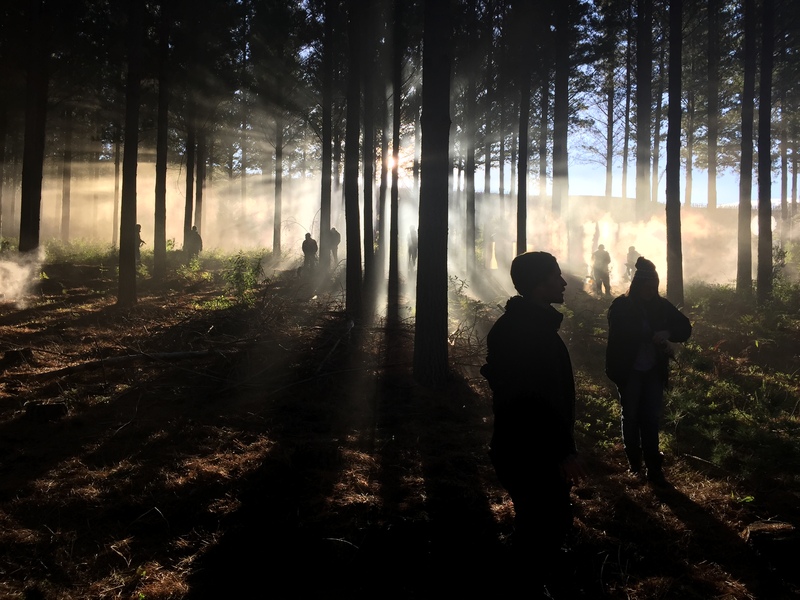 There is also a huge film community in Cape Town, with tons of production support that would make filming there a perfect fit. The US Dollar also goes very far in South Africa, which helped as well. But planning a promo shoot a continent away posed a huge challenge. And it also meant getting everyone on board with even embracing the IDEA of shooting a promo while they were still shooting the show itself. After all, with their schedule, they were slated to shoot 6 day weeks and 10 hour days, leaving few days off to shoot promos. Add in the fact that we had a huge cast of top-level actors signed on to the roles, along with multiple groups to cover off (Natives, Pilgrims, Strangers) meant that we needed to get a lot of coverage in a short amount of time. So the first thing we had to do was line up a concept for what we would shoot – because it’s a lot easier to sell in the idea of going across the world to shoot something when you have a great idea to sell in. DP Oli Miller shoots with a reasonably epic backdrop. Native American inspiration board from Variable concept deck. DEFYING CONVENTION #2: PULLING THE RUG OUT FROM THE PITCH. A topic I haven’t dealt with a lot in previous blog posts is pitching concepts with multiple agencies – at Nat Geo, we don’t do it very often. We usually do it when we need lots of fresh ideas or if the show is a real challenge to promote, so getting several agencies or creatives to pitch their ideas helps us find what we want to do. And even when we DO hire agencies to pitch, we often have our internal team pitch ideas as well – or work with the ‘winning’ agency to refine their idea even more. With Saints, my initial thought was to do a pitch. It was going to be a huge priority, and there were a lot of different ways to tackle this project. Opening it up to a pitch situation was an interesting way that I could get more ideas, and make sure we were thinking big. So I reached out to our friends at Variable in NYC as our first potential partner – but I hadn’t yet figured out the other potential agencies to pitch. As I sat and thought long and hard of other companies that could also work on this job and bring some incredible ideas as well as organize the huge production needs, it dawned on me that I was approaching it with the wrong mindset. In this case, it wasn’t just about getting great ideas – I really needed 100% confidence that whoever would win the bid would be able to work really collaboratively with my team, would be able to scale up to a massive production (in Africa, no less), seamlessly fit in with the show production unit to share assets (hair, makeup, sets, wardrobe, art, locations), be a trustworthy ambassador for Nat Geo, and also deliver the visual goods that made the film feel premium and extremely cinematic. I couldn’t think of a reason to look beyond Variable, honestly. It just seemed like a waste of money (we always pay pitch fees to potential agencies) and time to go through the exercise of pitching, especially knowing the timeline was so tight. So I called Variable back and said “it’s you guys and you guys alone – let’s bring it.” That really got the project off on the right foot, and our confidence in them I believe got us there quicker and with a great result. Variable tapped Jon Bregel and Salomon Ligthelm to direct and lead the process from their side, and Creative Directors Tyler Korba and Brian Everett from my team joined in the creative development from Geo. We briefed the team, and outlined what we were looking to capture, and the creative development began. 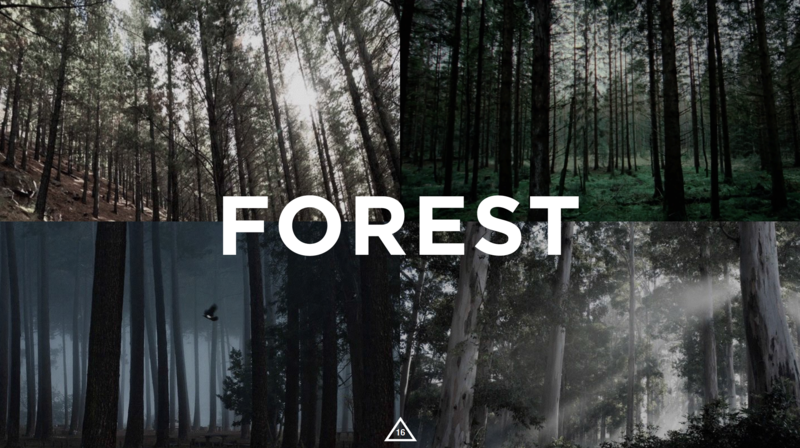 Mood board for forest location look. Over the next few weeks, we began to work closely with Variable to develop some concepts – our goal was to create something that would feel very tease-y and long lead that captured the spirit of the show, and the production values of a Hollywood film. Shooting while the show was still in production meant that we would have the show talent and assets to bring the film to life that felt accurate and representational to what the story was, but would allow us to experiment in a more conceptual space. It would need to feel gritty, introductory, iconic, and NOT just a re-telling of the same story in the film. We didn’t want the show team to think we were just re-shooting the same scenes from the film, but rather that we were re-imagining them in a promotional style. Like the way that we staged the assassination of Abe Lincoln in “Killing Lincoln” or of JFK in “Killing Kennedy” we wanted to bring this iconic story to life in a way that hadn’t been seen before – dramatic, elegant, striking, and cinematic. We explored a huge variety of concepts – but we continually came back to simple, striking moments. 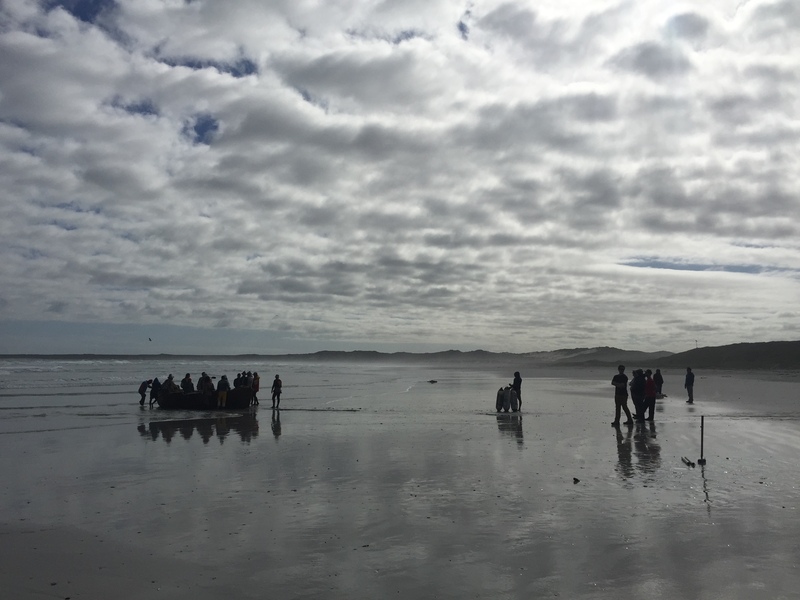 The first Pilgrims landing on the beach. The fear of the unknown. Aggression, battles, tension. It’s always a challenge in those early days of creative discussions to see the potential of an idea when it’s only been barely formed – but one idea that came up early as just a nascent thought was one that stuck through until the very end. As I mentioned earlier, the idea that these two groups seemed so different but actually shared a similar experience was something that really felt like a rich playground to play in. Salomon had come up with the idea of prayers as an anchoring idea – something to build the spot around as a backbone that laddered up to that bigger concept. The Pilgrims were obviously a devout group that relied on deep belief and faith, and while the Native Americans didn’t pray to the same higher power, they were also devout and highly spiritual. Salomon is a Director with a strong music and sound approach to his creative, and he came to the table with the idea of weaving a Pilgrim prayer with a Native American chant – each one building on each other, forming a track that was half English, half Native, and wholly exciting and dramatic. Once we had that backbone of an idea, applying visuals to the concept was fairly easy. 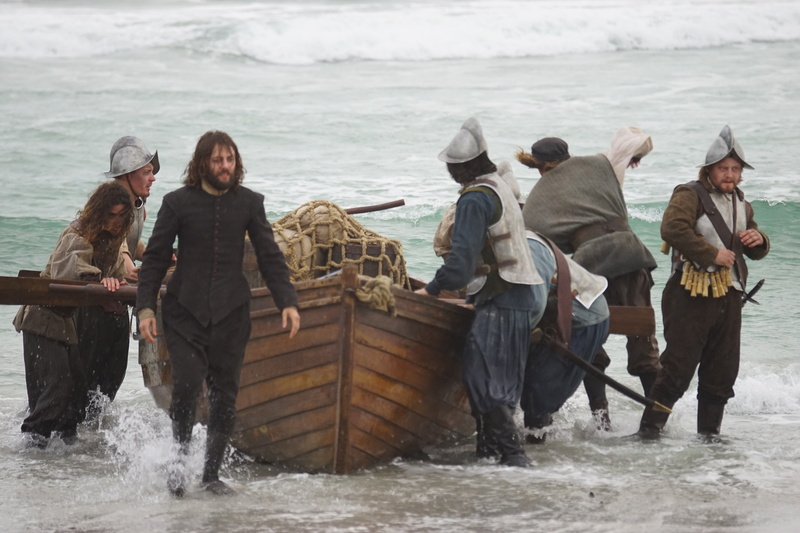 Knowing that we wanted to capture the uncertainty of those first moments when the Pilgrims landed on the beach, it made sense that that moment be anchored around a prayer from William Bradford, the lead character of the film (played by ‘Mad Men’ actor Vincent Kartheiser) and Pilgrim leader. It was important to portray the Native characters authentically as well – they weren’t instigators or more violent or ‘savage’ than the English, but cautious, guarded, and frightened as well. Balancing those two different groups and building the tension between them was the key. Similarly to what we did in the Kennedy campaign, we wanted to have two main ideas going into the shoot – not necessarily to have a “backup” but also not to paint ourselves in a corner too much in case it didn’t work out editorially with the “Prayers” idea. Jon Bregel spearheaded the idea of “Tales of Savages” (which eventually got shortened to just “Tales”) which started with the idea of an English character recounting tales of the Natives that he had experienced from being in the New World before. The POV of the “strangers” in this story is one that is not well known – but these mercenaries and adventurers were dubious of the Natives based on their prior experiences in the New World, and we wanted to capture that tension, animosity, and uncertainty in a more intense and visceral manner than the “Prayers” promo idea. Some early imagery and many long conference calls started to shape the idea, and everyone was feeling great about these two ideas as starting points for some great creative. We knew we didn’t want to re-shoot the film, so it needed to feel different enough from the show content, but still connected to the same basic themes. After walking the show producers through the idea, it was clear that they were excited about it and felt like it was staying true to their film. Actor Ron Livingston on-set as Governor John Carver. After numerous back and forth conversations with the Nat Geo production team, it was clear that Sony and Little Engine (the show producers) had their hands very full. They were still working on casting, location, and a schedule for the shoot at the same time as we were planning our promo shoot. The film itself was clearly the priority, so they didn’t have a dedicated person in hand that could help us accomplish what we wanted to, and to liaise with all of the various departments to ensure we were using the same art/wardrobe, hair/makeup and locations. Director Jon Bregel in action with the e-z rig. It was a massive task, and with the number of questions we needed answered ASAP, they recommended an on-the-ground producer to be our point of contact between units. We hired South African producer Cindy Viljoen without knowing her or meeting her, just relying on her coming as a recommendation from the South African team. We had no other choice, and looking back on it, we probably couldn’t have done it all without her. She found a way to get the two separate productions together, and became an absolute fountain of local knowledge and logistics that set us up for success. Even though we were unsure at first if it was a good idea to bring in an unknown entity to the team, within hours it was obvious that she was going to be a godsend. The team at Variable had daily skype calls with her, and little by little we chipped away at our herculean list of questions. Within a day or so, that ‘stranger’ became part of our little production family. In addition, we hired a Director of Photography that we’d never worked with either. Oliver Millar, a really talented DP based out of Tokyo was someone that Sal and Jon had really wanted to team up with – they spoke with Oli and studied his work, and he felt like a great fit not only from a personality fit, but also a creative one. We hired him, and couldn’t wait to see what he could add to the team. More reference swipe prior to production beginning. Meanwhile, production continued, creative development continued, and the shoot was all coming together. We would have 3 days in total to shoot, and we had to work around the show team. Luckily, there was a patch of days where the show team wasn’t shooting with one group (the Natives) and then another couple of days where they weren’t filming with the Settlers. 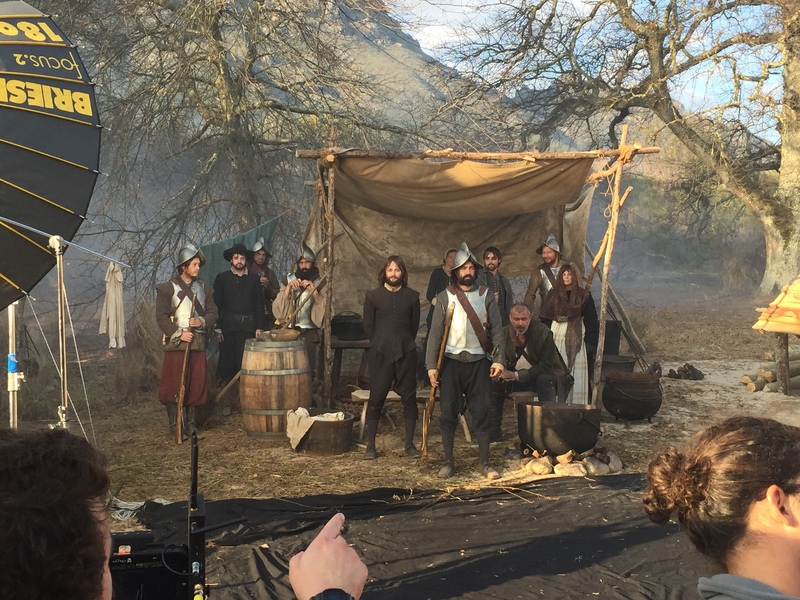 Because we were shooting with the actors on their down days, and never at the same time, it meant that our creative had to be shot without ever seeing Natives and English/Pilgrims in the frame at the same time. Shot lists began to come together, budgets started to crystallize, and flights to Africa got booked. 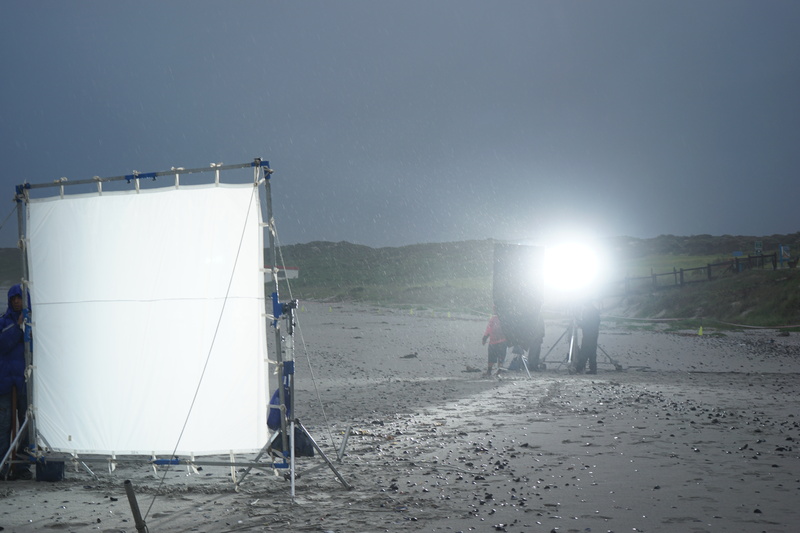 Shooting on the beach, day 3. Despite a brief scare just a week prior to the shoot when the show requested that we move our shoot to two weeks later, plus a brief work visa emergency for the Variable team, all of the big issues slowly started to work themselves out and plans were underway. We had several two-hour conference calls to discuss every detail imaginable, logistic and creative. We went over and over our scripts and schedules and shots, drilling down every day just a little more than the day before to get ourselves set up for success. We set up a plan where Sal would arrive a week prior to shooting, and me the day after, so we could have a solid 3 days to location scout out everything, including 2 days with the full Variable team on the ground as well. That would also give us time to meet with the cast, the Executive Producers, and the local production team that we’d rely on so much for assistance with everything. I was extremely excited – after all, I had never really worked with Salomon since he’d joined Variable, and I was eager to see his vision come to life and to work hand-in-hand with him on the ground as soon as we started to bring his vision to life. We had done all of our homework – including hours of discussing script details with our Standards and Practices team to ensure that the scripts our actors would be reading for both spots was accurate and period appropriate. Tyler Korba did another excellent job capturing the language and writing scripts that felt gritty and provocative – and every little tweak we made continued to focus them even more. We also were working closely with the dialect coach for the Native American scenes, and he wrote our Native chant that would make up the soundscape background for the “Prayers” spot. Our goal was to cover every single detail we could think of while we were stateside, because having done these sorts of shoots before while-in-production, we knew there would be something that could come up – so it was key to cover what we could while we could so we’d be better prepped for the unknowns. After 25 hours of travel from DC to Amsterdam then direct to Cape Town, I was greeted by our trusted guide, driver and PA Ghakeem, who took amazing care of us all week long. One of the best decisions we made early on was another ‘convention defied’ – our living arrangements. We decided that rather than get hotel rooms for everyone, we’d get two big group villas for the entire team to live in for the week. It’s probably pretty unconventional for the Client to stay in a big house with the Agency, but not for this group. The very first big job we’d done with Variable (“Are you tougher than a Boy Scout” – the very first Client Blog entry) we did this same setup and it worked perfectly. We repeated it in South Africa (even Tyler Ginter said people told him “you’re staying with your CLIENT? Are you crazy?”) and it was a bit unconventional but allowed us to reconvene every morning and every night to recount the day ahead and behind and better plan ahead. The adventure had begun and we were just days away from shooting. Planning for the next day’s first day of shooting from our group house. 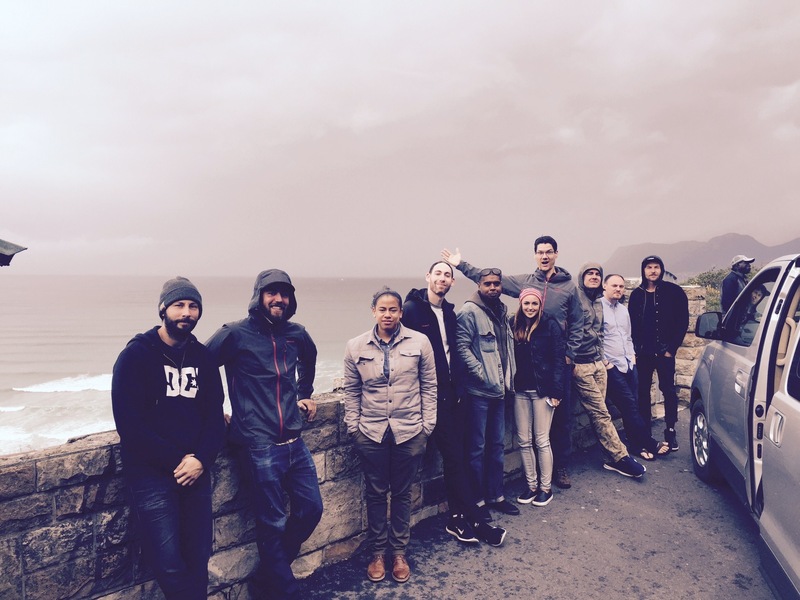 The team/family from Variable and Nat Geo: Dan Stewart, Brad Burke, Paige DeMarco, Alex Friedman, Ghakeem Humbles, Michelle Ginter, me, Jon Bregel, Jeff Levine and Salomon Ligthelm. After Sal and I spent a whole day with Cindy doing a scout day of potential beach locations and forests, on day 2 the entire Variable crew arrived. Hi-fives were exchanged, and hugs were given. They all piled out of the two vans and settled into the the villas – like something out of a summer camp movie, everyone jockeyed for rooms, calling bunks and dragging in dozens of Pelican cases. One aspect about the way that Variable works that is a little different is their approach to their core team – whenever possible, they almost always send their entire core team to every shoot. They don’t just send a Director, or an Executive Producer – they travel with their Art Department, Production Support, DigiTech, Producers, and 1st and 2nd ACs. It had always served us well on every other shoot we’d done with Variable, but I had to admit I was a bit unsure if it was a good idea for this shoot (at first). When we went location scouting the next morning, we had a team of like 14 people scouting with us, and even our South African producer Cindy was sort of shocked by how deep this team rolled! I thought to myself “should I have saved a bit on the budget and asked Variable to source more local talent?” I always get a little nervous before every big shoot and want to make sure it all goes smoothly – and knowing that we wanted to quietly and seamlessly fit into the existing show production but with a huge US crew – I was uncertain, I will admit. Location scouting to find the perfect beach landing spot. Part of our goal was to not make a big ripple – we were sensitive to the fact that some people might wonder why we even needed to be there. After all, they were shooting a beautiful movie – why did we need to come in and shoot more footage on the same sets, with the same cast and props and sets? As I mentioned earlier, the need for materials earlier, plus more stylized content for long-lead teases, dictated that we go – but a crew this size might not fly under the radar as I had imagined. But it didn’t take long to see that this system is part of the formula for success for Variable – and a big reason for our success together. Their ability to communicate seamlessly across the team because of that comfort is huge. There is no new ego to massage, no unfamiliar faces in many critical roles, and a real secondhand when it came to just getting it all done. They work together everywhere, and have bonded so tightly that any crisis that comes up is that much easier to solve. This project just re-affirmed that, as with any production we had many challenges. But being able to rely 1000% on your trusted team will help overcome those challenges quicker and more effectively. And while the budget had to support more travel costs – I guarantee we couldn’t have gotten done what we did without that unified team approach. Another convention defied! DAY 1: NATIVE AMERICAN SHOOT. Our first day was going to be the most difficult logistically – not always the way you want to start a big shoot! We had two separate locations, including a 2 hour company move from a forest and then to the Native American village set. It’s not optimal to have an hour-long drive wedged in after lunch in the middle of your 10 hour day, but Salomon had found an amazing forest that provided the perfect treeline density for the exact look we wanted. It meant we had to trim our shot list a bit, but it was worth it. When we first set out scouting for that day, we knew it was, well, unconventional, to lose that many hours in a big move, but it had to be done. We broke up into two units – one Phantom unit led by Jon and the Red unit on Steadicam led by Salomon. The shot list was made up of lots of Natives in the woods, running, stalking, and posing. We also got Phantom shots of our bow and arrow release for the end of the spot. 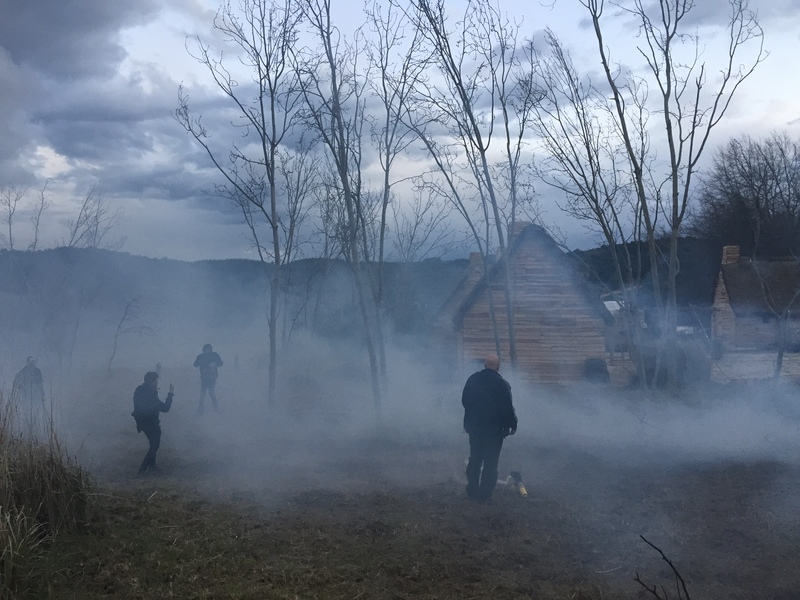 There was a real controlled chaos in the woods – two crews running and gunning, shooting tons of coverage and dealing with cold weather and high winds that kept shifting our smoke around. The smoky look was going to tie the whole spot together and it was pretty tough to keep it looking good with high winds – anyone watching us would probably think we were pretty crazy. I am pretty sure the 1st AD, who wasn’t from the Variable ‘family’ was losing her mind but the rest of us had big grins on our faces and excitement to burn. 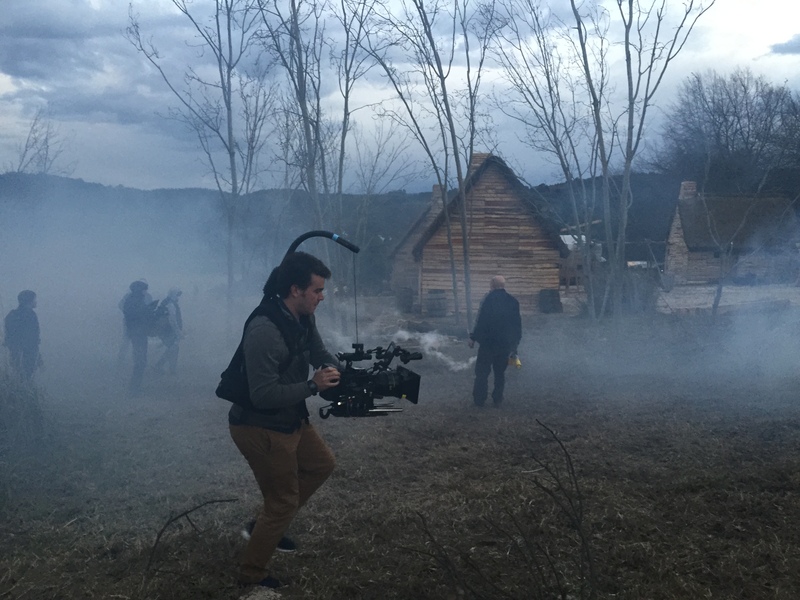 After our company move (and we even saw Sean Penn scouting our same location for a project he was filming) we began shooting in the Native American village – this was the scene we wanted to capture of our Native running back to report to the Chief Massasoit that the English were coming. 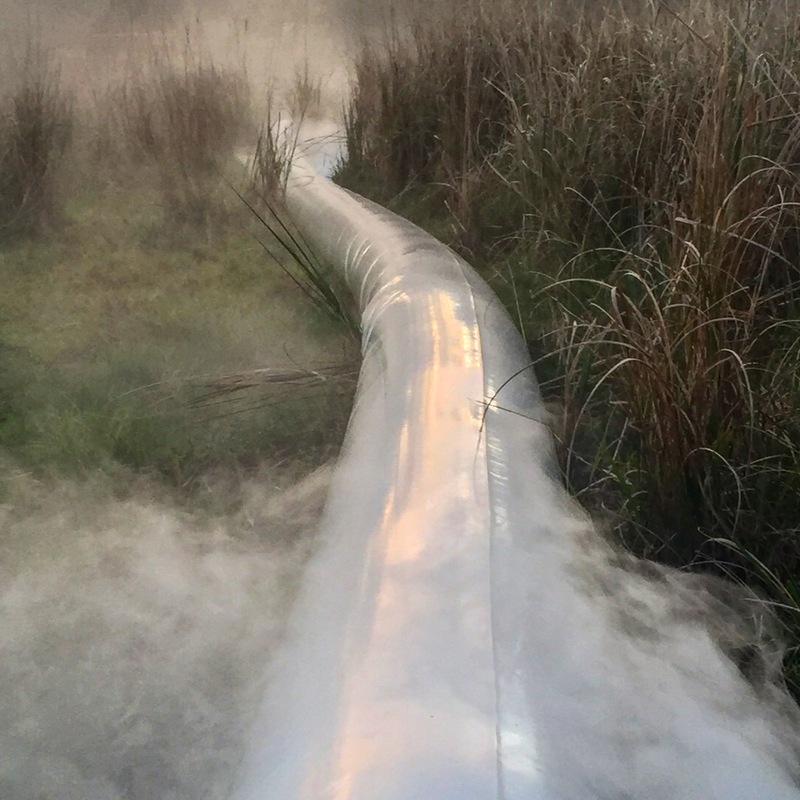 We had the largest smoke machine I’d ever seen, literally a giant tube that stretched for hundreds of feet around the entire camp, billowing out smoke for hours, and again we split into two crews capturing as much as possible. I love those sorts of shoots because I can bounce from group to group wherever I’m needed to approve shots, or manage talent, or direct a shot or two if needed. The highlight of the day was definitely hanging out with Raoul Trujillo, who played Massasoit. We had pulled a lot of Terence Malick references from “The New World” and Raoul had been in that movie all those years before – so during a break we all circled around him as he regaled us with stories of working with Malick. We all had huge grins on our faces again, geeking out on old filmmaker war stories. Truly awesome. Above: Our album cover photo shot in the woods, and below it is the most epic smoke machine ever. 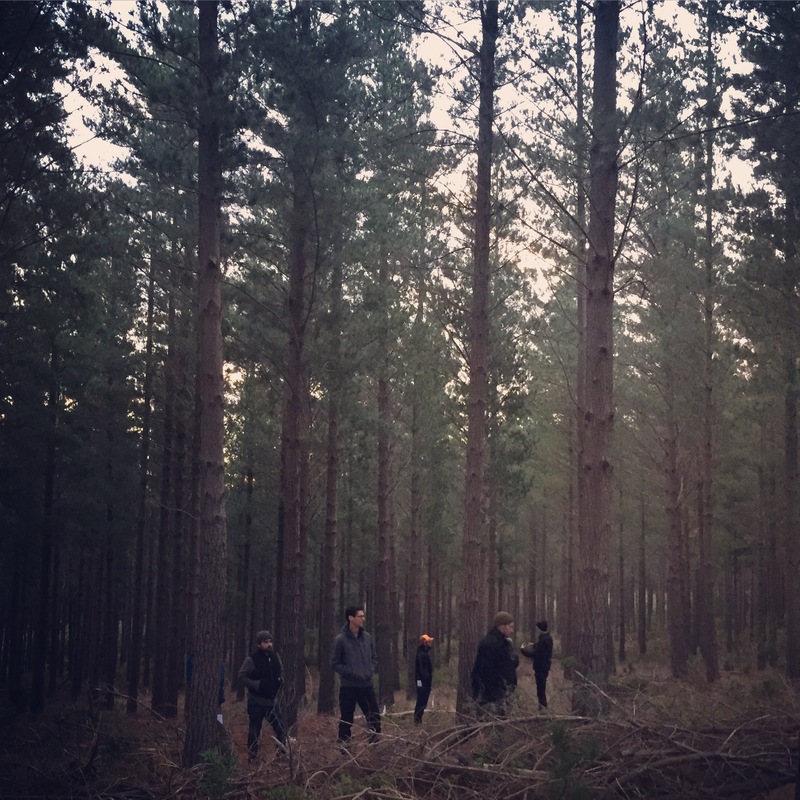 Sal and the team in the forest at sunrise. The Native cast was totally game all day, and worked their butts off for us and with us. 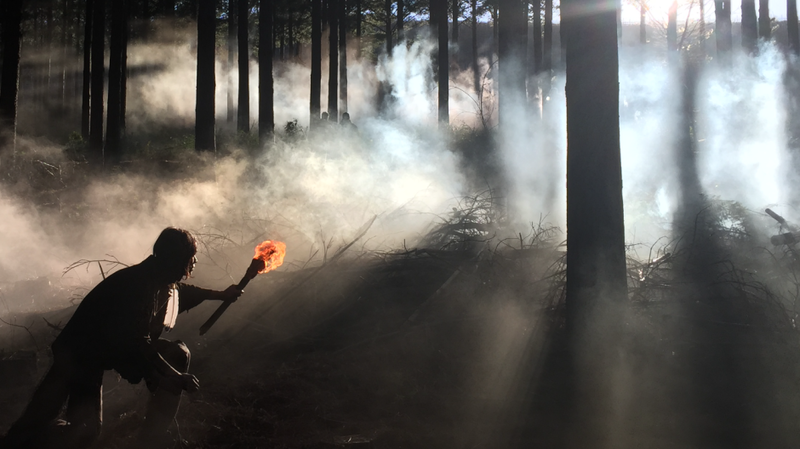 When the sun set on day 1, we knew we had some killer footage and were excited for the next day – we wrapped the Natives and began to prepare for our shoot with the ‘English’ cast. I also had lots of questions and uncertainties – after all, when we shot with the Native American cast, they had not even begun shooting any of their scenes yet, whereas the English cast had been shooting for multiple long days. The way we’d worked with the film’s 1st Unit was that we were both shooting simultaneously, with different cast. 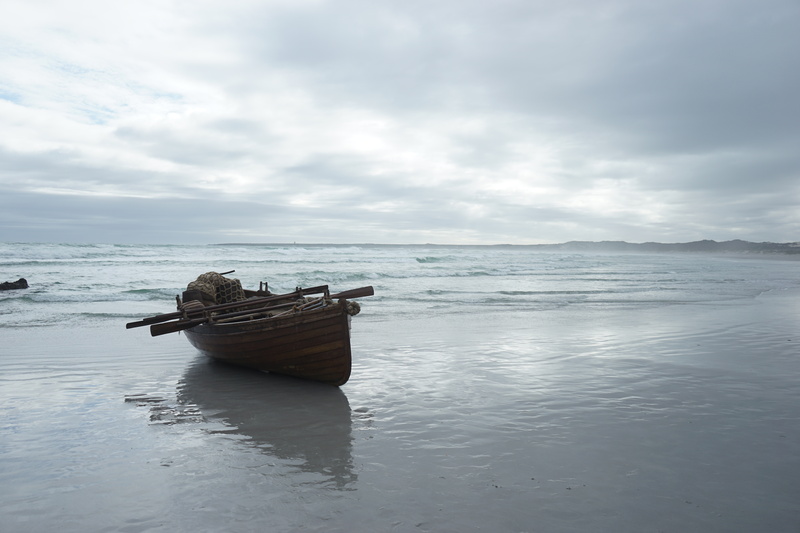 So while we shot with the Native cast, the 1st Unit was shooting with the English – and they had some long, difficult shooting days on the beach, shooting the landing scene in icy ocean water for hours. The English cast also had some heavyweight actors – Vincent Kartheiser, who played Pete Campbell on “Madmen” plus Ron Livingston (“Office Space”, “Band of Brothers”) and Ray Stevenson (“Dexter”, “Divergent”). Hopefully they’d be just as up for an adventure as the Native cast members! DAY 2: MEET THE PILGRIMS. Our sets were spread all over Cape Town (a much bigger city than I’d imagined), but one advantage to driving for over an hour to get to each set was that we had lots of time in the cars to prep. 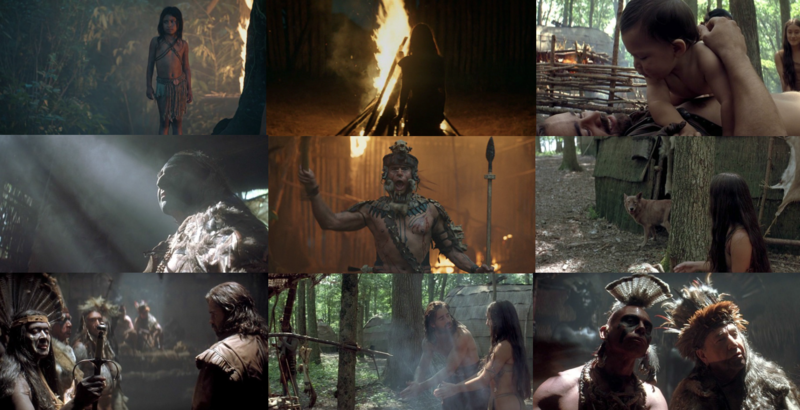 On day 2, Sal put together a PDF of frame grabs for what we’d shot with the Natives as we drove to the set (see above). 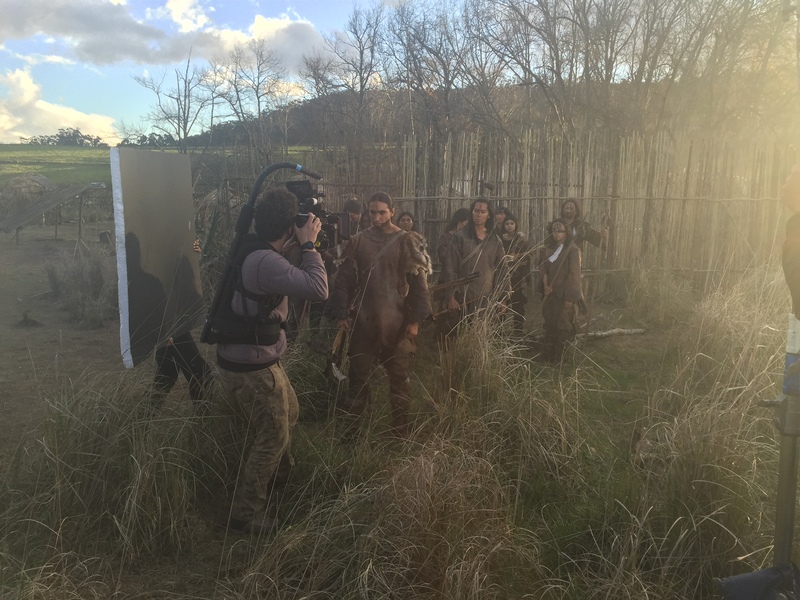 Our plan was to show it to the talent so they could see what we’d already shot with the Native cast. Hopefully it would get them excited to bring their “A” game, and also establish that we weren’t just a bunch of jokers! We were there to make them look good – and promote their film in the best possible way. Gina Mathews, the show’s Executive Producer, came to visit our set and I have to give a huge shout out to her, she understood why we were there, and what we needed to do. We couldn’t have accomplished it without her. Early on, we met with Vincent, who was a total ‘gamer’ and jumped right in – I think after memorizing dialogue and doing pages and pages of scripts per day for 1st unit, it was probably a breeze for him to “look through the window. Look sad. Pray!” as we were directing him for a series of living portraits caught with the Red Dragon and Phantom. All through the day, we had Vincent rotating between our 1st Unit (directed by Salomon) and our 2nd Unit (directed by Jon). The goal was to get a ton of coverage of moments with our cast that could be used in a variety of different manners in our promo campaign. 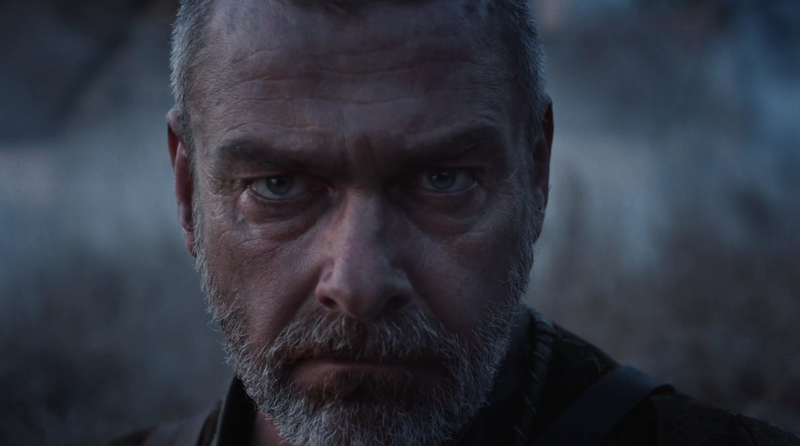 We also met with Ray Stevenson, who plays a huge role – Stephen Hopkins – in the film. We walked him through the day, and what we wanted to capture with him. As we discussed our goals and objectives with Ray, he had some ideas for the “Tales” spot which he was going to be the lead. Initially, we’d seen the spot as a to-camera narrative as Hopkins tells the stories of “The savages” and what was going to happen between the two groups. But Ray felt like it would be more powerful if he never spoke to camera, and that it was more like an inner monologue. It was one of those moments where Sal and I looked at each other and thought “yeah, that could work!” Salomon had this to say about that moment: “Ray suggested another way of playing it, and once we rolled camera we realized how valuable his approach was. I’m thankful we tossed out the storyboards on that one – we got such a great performance, having considered his note. We probably would have missed out on that moment if we hadn’t been open and reactive.” Keeping your actors happy, and creatively involved, is a HUGE part of these sorts of shoots. I’m sure they’d all probably prefer to take their day off, rather than get back into wardrobe and work another long day on set with a whole new crew. We still needed him to read the inner monologue though, so in classic improvised status, we hopped in a van, drove down the road to a secluded area, and recorded his lines. Sal and I sat in the back seat and were really taken by Ray’s performance. His voice was really striking, and he really nailed the delivery. We’d gone from a challenging situation to a solution quickly, and the result was going to be awesome creatively. 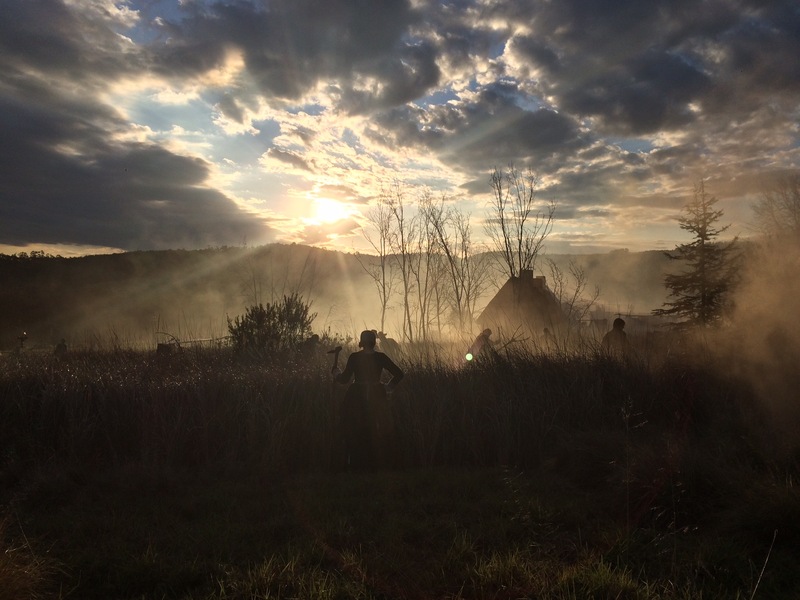 After we wrapped our main cast, we still shot for another couple of hours with our cast, and our smoke and effects team, getting shots of marching soldiers, workers in the fields around the village, and scared Pilgrims in their houses. Once again, we balanced the need to capture elements for our story (rising tension, fear, uncertainty) and extensive coverage that we would figure out later. Many times throughout the day we’d have to evaluate “would we need this shot?” and in some cases we shot stuff I never thought we’d use, but then we ended up using it in ways I never expected! We wrapped out in complete darkness, exhausted from a huge day and one where we’d made a few creative compromises, but ones that could result in an even better product. Day 3: The Final Shoot Day. AKA It’s good to be lucky. Day 3 was always going to be the ‘easiest’, yet the most critical of all of the days. While we had a full shoot day planned on the beach, capturing a variety of shots of the shallop (a large rowboat that traveled back and forth from the Mayflower to the shore) and crews disembarking and unloading supplies, we were really there with the intent of capturing the anchoring shot (no pun intended) of the “Prayers” spot – the landing on the beach of William Bradford (Vincent Kartheiser) and his prayer. That singular moment would open and close the spot, and we needed to capture it in a variety of ways for coverage. Giant light and the Atlantic Ocean. Note the crystal blue sky – not dramatic. On top of it all, we needed it to set the tone for the rest of the spot, the rest of which we had shot with a real moodiness and dramatic style. We’d used fog in almost every shot, and when we looked out at the beach that morning, all we could see was blue skies. The weather was calling for rain late, and we’d seen over the week how quickly things changed weather-wise, but we still were hoping we’d get a little more of an overcast look. We’d had a later call time for our cast, we’d set up “warming tents” with heaters and blankets since we knew they’d be in the cold ocean for hours, and we were all set to go. Vincent showed up, and we took off in our audio van again, and recorded his script, which would also be set up as an inner-monologue, culminating in a dramatic breaking of the fourth wall shot with him looking into the lens. It was such a fascinating experience to be a part of, as Sal and I were all cramped into a small van with Vincent, our audio team, and the dialect coach. I had never really thought about that before, but of course a non-British actor would need a dialect coach, and it was really cool to hear as they went back and forth, tweaking the lines and reads to make sure the inflection and tone was just right. It gave me an even greater respect for the work of actors, who have to not only memorize lines and ‘own’ them in performance, but also deliver them perfectly and accurately. It was pretty cool to witness it firsthand in close quarters. 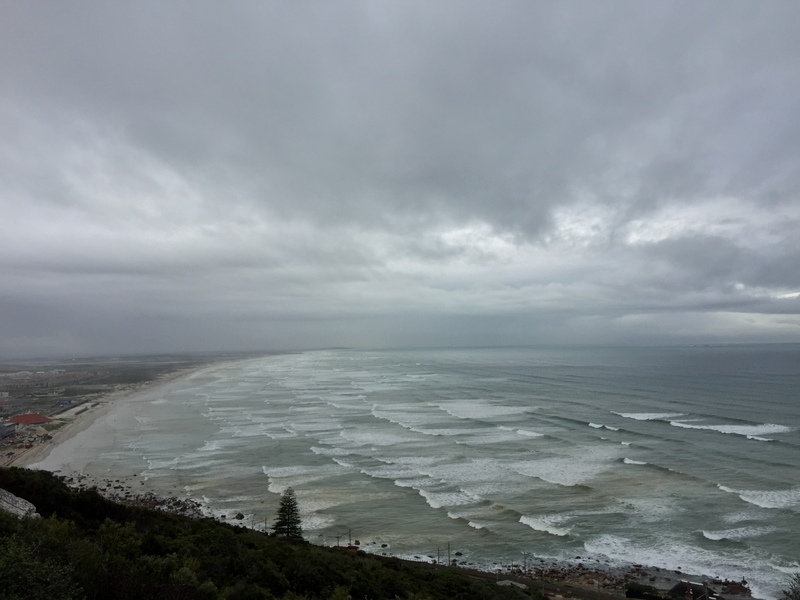 By late afternoon, the wind was whipping up and the clouds started to roll in. We’d shot our b-roll of the boat and some end plates and title plates, and we moved the giant shallop into position. There was a huge team of people involved, including extras, and ‘frogmen’ dressed as extras there to ensure that everyone was safe in the water. The boat was rather large, so having several people there to make sure it didn’t wash away or get damaged in any way was key – this was the same shallop they were using in the show, and the same safety and diving team. Watching them work as a team, with hand signals for every action in the water, was also really impressive. At the exact moment that we brought Vincent on set to shoot the big scene, the skies opened up and the deluge began. I’ve never been on set for a rainstorm that epic, and while it certainly caused a scramble to get cameras covered and umbrellas up, it was actually quite perfect. The moody look we were going for was attained, and shooting tight on Vincent’s face in the rain, with beads of water on his face and his hair wet and matted, gave the perfect gritty feeling we wanted. It was also awesome watching Salomon directing the mayhem, running around getting soaked and it didn’t bother him in the least. “I distinctly remember the last day, when it started raining and we had already found somewhat of a rhythm with everyone” says Salomon. 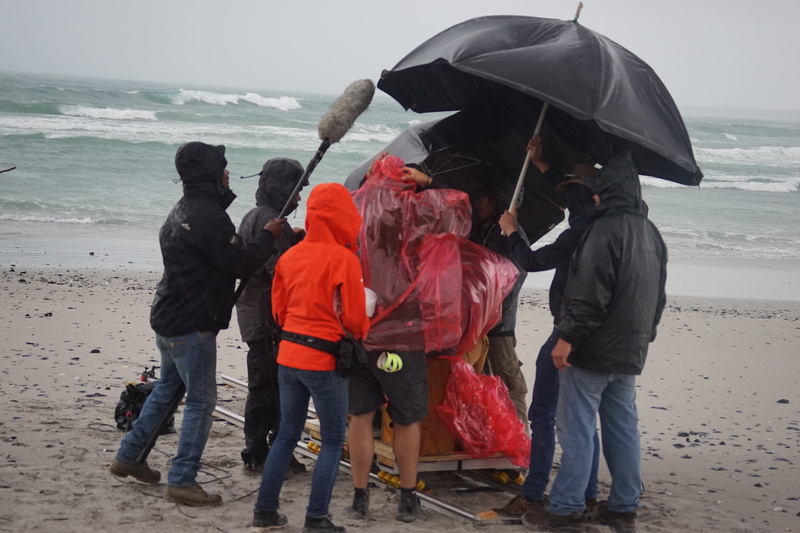 “We had this crazy downpour and in a moment where everyone could have gotten fed up, but everyone pulled together – the days of bonding before, allowed us to capture something really magical with Vincent on the beach.” This is what it was all about – the final moments of a massive, massive, shoot and our last shot was arguably our most important one of all. Maintaining that energy from the very first shot in the forest to right here on the beach was the only way to get it all done, and it was an extremely satisfying feeling to see it all come together in those final moments. A rain-soaked set on day 3! 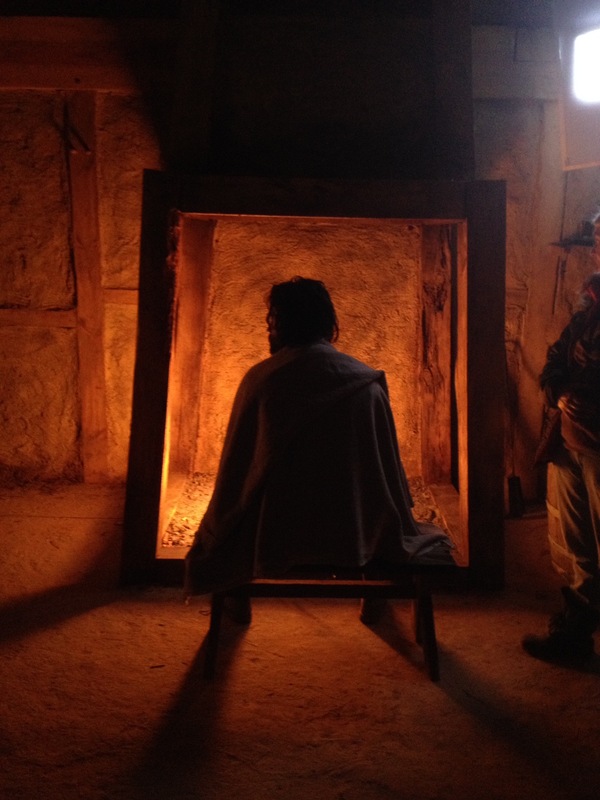 We wrapped the cast and crew, and Sal and many others ran to the warming tents, shivering cold and soaking wet, but filled with that feeling we all have felt while in production: elated, creatively energized, and excited to see the results on screen. THE FINAL CONVENTION DEFIED: POST PRODUCTION. During the shoot, Tyler Ginter and I had been talking a lot about the post process. We’d never worked with Variable in that way before – we’d had them involved with other post houses, but never had them actually manage the edit. I’ve talked about companies that can offer different varieties of creative services like editorial, shooting, writing, etc – and we were looking at different options for how we wanted to handle the post portion. My initial instinct had been to go with either a local editor, or one of the post houses we work with that has great trailer editors. I talked to Tyler multiple times on the shoot, and as the Client it was definitely “my” decision to make regarding who I wanted to cut the spot. I knew that no matter what, I wanted Salomon to be involved, but I wasn’t sure how – putting together a post production team is a bit like a jigsaw puzzle sometimes. You get a bunch of different pieces, like a Director, a DP, an editor, sound mixer, colorist, etc. But the more we talked, the more I thought about it, the more deep we got into the production, and the more we shot, the more I knew that I needed to give them a shot at editorial. The idea of simply handing off this footage to someone else, sort of felt like it would not be fair to them to have invested so much time and energy and creative spirit into the creation of the idea with us, the planning, the shooting, the travel, the passion – and then have someone else cut it and color it. While I can’t remember a time in my career where I went out on a limb to hire an editor for a project that I had never worked with before, it actually didn’t seem like a risk at all. And while Variable had done creative development and execution on some smaller projects, this would be their biggest swing yet at the whole enchilada – development, production, execution and delivery. The convention of “go with who you know” had not failed me yet, as we clearly work with Variable so much – and this was just an extension of that. So Variable set up a dedicated post team, and hired a great editor (Joel Douris) to work closely with Salomon on the project. 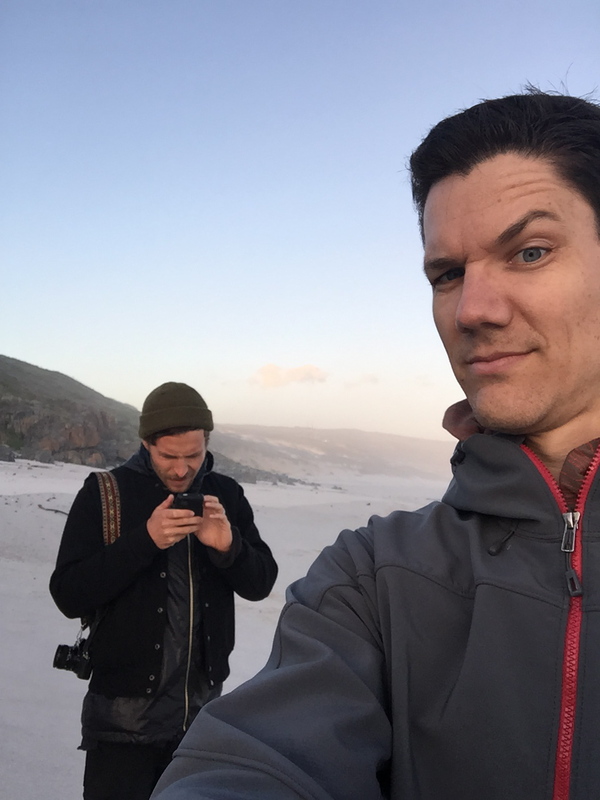 We set out cutting immediately when we returned from Cape Town, and even looking at the very first cuts on my iPhone while on vacation it was clear that we had the goods. We also brought on the team at Defacto Sound to help out with our mix and sound design – their work with Salomon on “Anomaly” was so fantastic, and Sal had such a comfort level with them (as do I, we work with them often since they are based in DC) it made sense. Sal also suggested having Ryan Taubert score the piece – again, another one of his frequent creative partners, and in the spirit of keeping the team familiar, it was a no-brainer. After a few weeks of back and forth and fine tuning every single detail imaginable with the edits, we had two incredibly strong spots that we were very proud of. Brian Everett completed all of the graphic details, including the final logo animations and text callouts (which we added late in the game to ensure that the time, location and story was clear – adding “New Plymouth” really helped identify where/when we were in history). Sal and I on the beach discussing shots on day 3. Photo by Kevin Lahr. 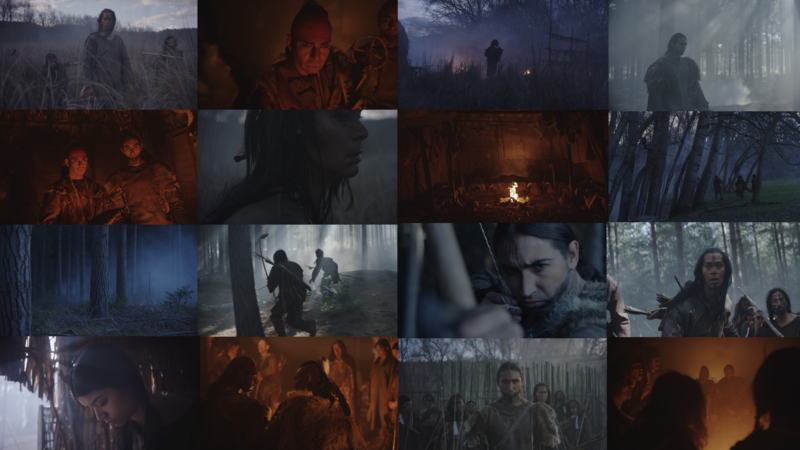 We’d set out with the hope of getting one great spot – with one as a possible “backup” should something not work, but in the end we got two that felt different and powerful and cinematic – and accomplished our goal of bringing the story of the Pilgrims and Native Americans to life in a way that nobody had seen before. Here is the final “Prayers” promo. And the “Tales” spot with Ray at the center also came together at the same time – it told a different side of the story, and felt different yet consistent visually (we purposefully didn’t use any of the same shots from spot to spot). We tweaked the music, added different instruments, and it came together quickly. We worked really hard on details like ensuring that neither ‘side’ felt more aggressive than the other – this film would be a balanced look at the politics and tensions between groups, and within those groups as well. Here is the final “Tales” promo. KEY ART: PUTTING PLYMOUTH ROCK IN A STUDIO. We decided early on that given the amount we had to shoot in South Africa, it made more sense to go higher concept for key art, and something that felt less about the particular characters, and more about the bigger story – the struggle and tension ahead for both groups. We partnered up with The Refinery and their initial concepts touched on a ton of similar themes. We selected a sketch that was also very foggy and dramatic, and immediately read as a “Mayflower story” which we knew was critical to establish the story and the stakes. We shot the image in LA and Brian Everett led the charge with photographer James Minchin (our “Killing Jesus” key art photographer). They followed the same formula of sticking with the same costuming as the show, and ensured that every detail was just as accurate as the show itself – using frame grabs from the shoot of the Native character Hobbomock’s wardrobe. The end result has some very nice parallels to the final promos, and it’s all tied together with the headline “The Mayflower is coming” which was an intentional way to ensure you knew where and when we are in history. I will always have a place in my heart for working on scripted films with a historical bent. The “Killing” series has produced some of our best work, and there’s always something about working in scripted that feels like you can take even bigger cinematic swings with the creative. And this project was no exception. We followed convention, in a way, by hiring our trusted partners in Variable, but beyond that there was so much that we’d never normally consider doing. And that’s all part of trust. You trust that those around you will work hard, and that trust – I’ve found at least – is often rewarded with people who work harder than they’ve ever worked in their life. When you trust in others, allow yourself to be open to adapting your ideas, and think bigger, the results are even more gratifying. A massive thank you to everyone on this job, especially Salomon and Jon, who poured their time, their hearts and their souls into making such great work. 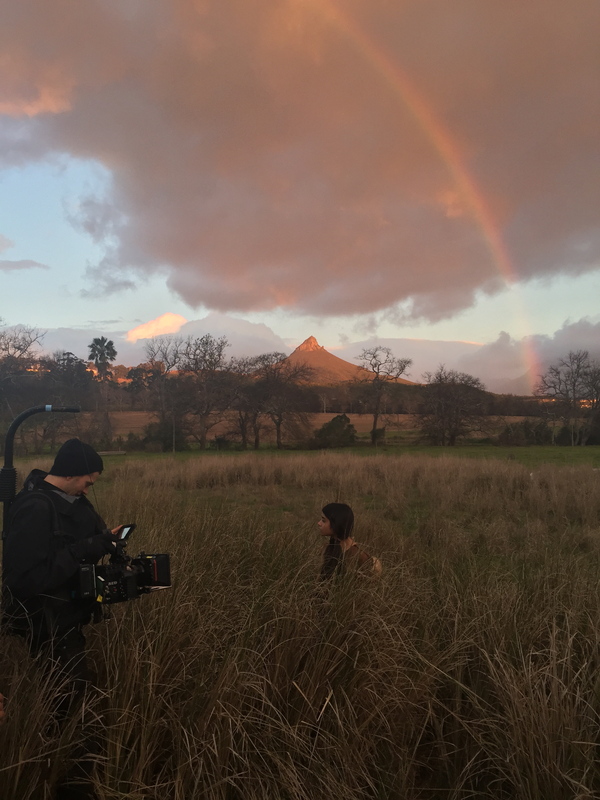 “This was by far the most seamless collaboration and process we’ve ever had based on trust and loyalty working with Nat Geo” said Tyler Ginter, Executive Producer of Variable. “We are so proud of the results because we had the opportunity to emotionally connect alongside the Nat Geo team from start through to the end.” Jon Bregel also had this to add: “It always makes me most happy to see people feeling good and having unfiltered fun (especially clients) when shoots are wrapped,” says Jon about the good feelings after the shoot, “it makes me feel that all of our efforts were well worth it. Work-life and non-work-life can co-exist most harmoniously when you trust the hearts and minds of those you work closest with. When those factors are in line, I find that the work is always the best it can be, and life outside of work is as fulfilling as it can be.” When it’s all said and done, yeah we made a promo for a TV show, but it means so much more than that. We created, collaborated, laughed, stressed out, shot, edited and produced something that we’re all very proud of and feels true to the film, and true the story we set out to tell. And in what may have been the finest compliment we could be paid, the show actually used some of our promo footage within their film – truly an honor, and a tribute to the hard work that this incredible team put into this project. 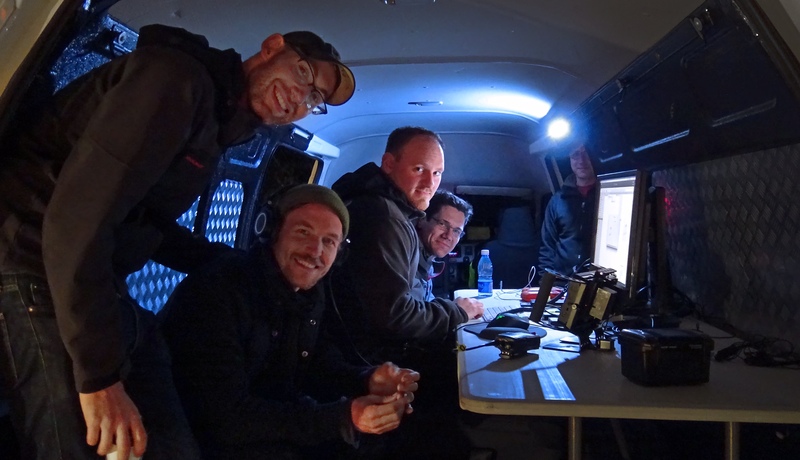 In the DIT van after day two with Alex Friedman, Salomon Ligthelm, Jeff Levine and me. Photo by Jon Bregel. So, at long last, the BTS video for the project. 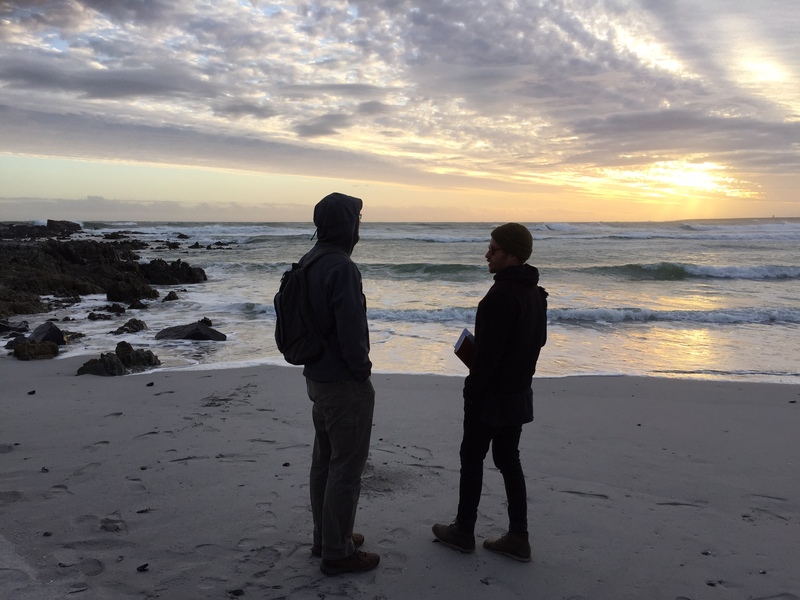 We hired Frans from Dreamcatcher Productions, a local Cape Town filmmaker to shoot it, and the excellent filmmaker/editor Jon Connor to cut it. I guess it was a convention-defied that we had also never worked together before with him editing something for me – it turned out really great, and I’m happy it’s finally hit the light of day. Enjoy, and thanks for reading. Great insight as usual! Really appreciate your perspective on all your posts. You’re the man, Andy! Thanks for sharing! Exciting to read and get a look at the complex integration of promo production alongside the film. Side note — It looks like the links have not been properly pasted for the different videos. They are all currently the “Portraits” teaser instead of the individual “Prayers” and “Tales” promos. Enjoyed the read! Hey Mathias, I went back and rechecked the post but all the links are working and connected to the right videos. What are you screening them on? Weird — I was screening on Google Chrome earlier today and it just gave me repeat links. Maybe my connection was cashed incorrectly or something. Looks great now! I came across Salomon’s work a few years ago and then separately found Ryan Taubert and Variable and have been following them all ever since. It is really fascinating to have enjoyed the work of each of these creatives separately and now to see them all collaborating on these projects with Nat Geo is truly inspiring. Thanks Andy and your team for these addicting/insightful posts and thanks everyone for creating great work so we can be inspired. Solid idea taking sal’s recommendation of having Ryan Taubert do the score. That dude bleeds talent and he will eventually be unreachable because he’ll have so many projects on his plate. Use him while you can, his progression is exponential. Loved the insight into the shoot. It was epic and I have great memories of that. I love the clips and photos already posted. Will watch this space for the BTS. Hope to see you back in Cape Town again soon. This is such an amazing, in-depth walk through of a project that every creative dreams of. And not just because it turned out awesome (it did) but because it walks with equal weight through both the gritty and the glorious parts of filmmaking. Well done. I can’t wait to see what you work on next. Just wanted to thank you for spending the time writing up killer blog post like this. Its refreshing and insightful I appreciate it. Keep them coming! Thank for all your hard work and knowledge!